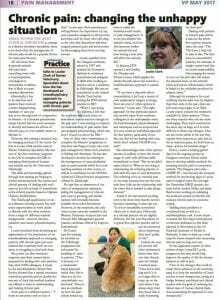 Davies Head of Anaesthesia Louise Clark is in the May 2017 edition of Veterinary Practice News giving insight into how the team at Davies Veterinary Specialists are handling chronic pain management, and how they have developed an interdisciplinary approach to managing patients. Louise has worked at Davies for 10 years and recently spoke at the Association of Veterinary Anaesthetists conference, the theme of which was Chronic Pain. Louise was one of the first veterinary surgeons in the UK to complete the MSc in managing clinical pain in humans and animals run by the University of Edinburgh. The skills and knowledge gained through that training are helping in further advancing both the science and clinical practice of dealing with such cases.